Before each adventure, we invite Jesus in prayer. That's why we call this club, Outdoors with Jesus. It is because of your participation and prayers we are able to invite you to these mountain adventures. We biked the causeway of Antelope Island, Jordan River Parkway, and Legacy Parkway. Also, joined the Good News Jail Ministry bicycle ride in Park City. 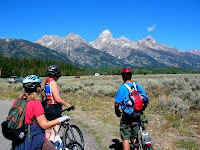 Also, some of us enjoyed riding the new parkway trail to Jenny Lake in the Tetons. 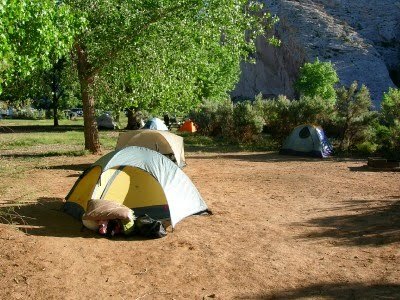 We camped at Dinosaur National Monument. God blessed us with exciting adventures. It was free admission to the monument in 2010. We enjoyed Wasatch Mountain State Park, skiing on the golf course. Snake Creek Pass, Millcreek Pipeline, Lake Solitude, and Red Pine Lake hikes had the best colors. Some of the group went fishing at Smith and Moorehouse Reservoir, Mirror Lake, Desolation Lake, Upper Red Pine Lake, Wall Lake, Trial Lake, Lake Mary, and Cecret Lake. We rode the Union Pacific Rail Trail, and Round Valley, had our first Mystery Ride, and went to Antelope Isle. Lake Mary, Martha, Twin Lakes Reservoir, Lake Solitude, Dog Lake, Desolation Lake, Wall Lake, Trail Lake, Mirror Lake, Fehr Lake, Shepherd Lake, Cecret Lake, Marshall Lake, Hoover Lake, and Lower & Upper Red Pine Lakes. We hiked to the Livingroom, Coldwater Canyon overlook, and Snake Creek Pass. We hiked Frary Peak, on the top of Antelope Island, and the Big Beacon. We had first time visits to Snowbasin, Wasatch Mountain State Park, and completed the entire North Fork Loop in the Uintas. And had fun up Big Cottonwood Canyon. We hiked to Waterfall Canyon, Adams Canyon, and Stewart Falls at Sundance. We hiked to Cecret Lake during Alta's Wildflower Festival. Also, enjoyed wildflower in Brighton, Park City, Millcreek Canyon and Smith and Moorehouse. We saw goats carrying back packs to Wall Lake, a family of moose on the wildflower hike, deer in their den on the snake creek hike and more. Wonderful warm Autumn day with Jesus! We heard classical music on the trail from Log Haven. Today was free day in Millcreek canyon! And dogs enjoyed playing in the leaves. DESCRIPTION: From the Burch Hollow trailhead, follow the pipeline trail west. This trail is great for hiking, jogging, walking dogs, and mountain biking. You'll enjoy walking through scrub oaks and see great canyon views. This makes a great evening hike, if you want to see city lights. Also, it is an easy snowshoe trail in the Winter. KID FRIENDLY ~ Watch out for bikers! MILEAGE: 1.6 miles to Church Fork junction. We hiked 2 miles each way. RESTROOMS: No restrooms at trailhead. You'll find some at picnic areas. DOGS love this trail on odd days! More mountain bikers will be on the trail on even days, because they are allowed to ride the upper canyon. GEAR: Bring water! This trail can be hot in the afternoon. This was an energetic ride with Jesus! We had a head wind biking to Round Valley. The return trip was a blast, riding 15mph to 25mph back. 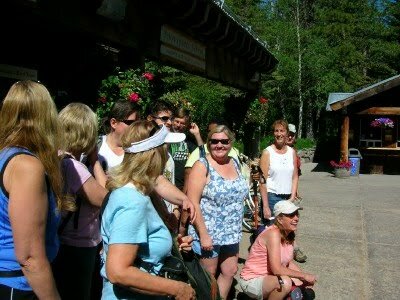 DESCRIPTION: At Promontory, ride the rail trail toward Park City. Be careful crossing the Kamas road. After riding the first paved section to the gate, turn right and bike up the road. You'll find a paved parkway trail on the right. Stay on this trail until you reach the ballpark. There are restrooms, pop machines, and picnic tables to take a break. Take Quinns Trail south up the hill. Turn left at the next road. Go straight (north) at the next junction. Turn left, biking west up the next hill to a parking area. Across the parking lot, you'll find the Round Valley trails. Bike up the trail and do not take the side trails. Turn left on Cammy's trail. At the top you'll find a bench to sit on. Ride up the Seventy Seven trail and turn right on the Valderoad. You'll enjoy a roller coaster ride back to the ball park. hang a left, drive east, turn right on Promontory Ranch Road. Look for parking lot with a restroom on the left with the Union Pacific Rail Trail sign. We enjoyed a wonderful Autumn day with Jesus! Pictures can not even capture the beautiful fall colors. We saw hawks soar in the sky above, and cows on the trail. DESCRIPTION: Look for the gated road below parking lot H. You'll find the Maples Trailhead sign. Take the old road down the hill. When you come upon a trail junction, do not take the Art Nord trail down. At the end of the road, you'll see a trail sign for Ogden Canyon Overlook by a picnic table. This is a great place for a break. The singletrack trail winds through a forest up the ridge to the saddle. Make sure you stay on the main trail, if you want to reach Coldwater Overlook. The trail is closed when wet. This trail is shared with horses, mountain bikers and leashed dogs. RESTROOMS: Available in the Lodge and Gift shop. MILEAGE: 2.5 miles to Coldwater Overlook. Incredible hike with Jesus. Today we saw some of the first Autumn colors. At Bald Mountain pass there was a sprinle of snow. On the trail, we hiked to four different lakes, walked on boardwalk, saw squirrels, and several even went fishing. We enjoyed lunch on the rocks overlooking the lake, had a Bible study and prayer. DESCRIPTION: There's a good trail to Shepherd Lake. We made the mistake of following the main trail down to Hoover Lake. Go around Shepherd lake to the south east shore, and follow deer trails down to Marshall Lake, closer to the mountain. MILEAGE: 2 miles to Marshall Lake, and .1 miles to Hoover. HIKE TIME: Allow 3 hours or more. ELEVATION: 375' elevation loss to Marshall. You'll climb a hill on your return. If you are hiking to Hoover Lake, add 82' elevation loss too. NO RESTROOMS available! Bald Mountain & Mirror Lake have vault restrooms. TRAILHEAD: Fehr Lake Trailhead is 1.2 miles down the road from Bald Mountain Pass on the right. If you drive past Moosehorn Campground, you'll gone too far. FEE: Mirror Lake Recreation Fee is $6 for 3 day pass. GEAR: Map, water, jacket, hat, sunscreen, camera, food, compass and whistle. God gave us a wonderful Labor Day hike. Cool air, sunny and a beautiful blue sky. We saw squirrels, birds and wildflowers. DESCRIPTION: A beautiful forest trail, following a stream to the lake. Hike 1.9 miles to the trail junction, where you can go to either Dog or Desolation Lake. The last 1/2 mile is a steep climb, with 500' elevation gain. Why not enjoy a 1/4 mile walk around the lake. MILEAGE: 2.5 miles to the lake. KIDS: Some kids were on the trail. WATERSHED: No dogs allowed in Big Cottonwood! RESTROOMS are open during the summer near trail head. DIRECTIONS: Big Cottonwood Canyon begins at Wasatch Blvd. and Fort Union Blvd. in Salt Lake City, Utah. Drive 9 miles up the canyon to Mill D and park. Wonderful bike ride with Jesus! One biker shared some sliced watermelon. What a great idea! DESCRIPTION: Wanship makes a great place to begin the Rail Trail. Riding through town, you'll see sheep and lamas. Leaving town, you'll cross wooden bridges, watch lazy cows, and see I-80. The first 6 miles is a gentle climb; then the trail levels out. There are shaded picnic tables to take breaks. Promontory has a restroom and is a great place for a break. The ride back to Wanship is exhilarating. Control your speed and watch out for loose gravel. RESTROOMS: At Wanship & Promontory parking areas. No water available. BIKE TIME: 3 hours, plus breaks. GEAR: Take extra water! Wear a helmet, take a jacket, bring bike tools, extra tube, and patch kit. Energy foods and fruits are a must. DIRECTIONS: From SLC, drive up I-80 eastbound, take Wanship exit, drive through town. Wanship Rail Trail parking is near the Spring Chicken Cafe, Hoytsville Road, and Old Lincoln Highway. Great weather today! Thank you Jesus! According to the weatherman it was suppose to be a wash-out! It was a great day for hiking! DESCRIPTION: This trail is shared with mountain bikers, joggers, and hikers. A scenic trail with an overlook, stream, wildflowers, forest and meadow. Desolation Lake is one of the most beautiful lakes in Big Cottonwood Canyon. There are a couple of steep sections on the trail; but most of the hike is moderate. Hikers have the right-of-way; but it is always good to get off the trail for a mountain bikers. MILEAGE: 3.5 miles to lake. GEAR: Make sure you bring plenty of water, jacket, and energy snacks. HIKE TIME: Allow 4 1/2 hours to have fun! WATERSHED AREA: No dogs allowed! Also, no swimming, no wading, & no washing in streams or lakes. RESTROOM: Available at Mill D North Fork during the Summer months. DIRECTIONS: Big Cottonwood Canyon begins at Wasatch Blvd, and Fort Union Blvd. in Salt Lake City, UT. Drive 9 miles up the canyon. Trail will be on the left. DESCRIPTION: From Park City ride the Railtrail to the second road. Turn left and go up the hill to the parkway trail. Turn left at the next trail marker. At Quinns trailhead, ride north on the road, until you find the Round Valley trailhead marker. Follow the Round Valley trail signs, take the High Loop, and riding down the first hill, take Seventy 101 and follow Valderoad all the way back to the ball park. Then retrace yourself back to the Railtrail and ride back to the parking lot. RESTROOM: available at the ball park. DIRECTIONS: From SLC take I-80 up Parley's Canyon, take Kimball Junction exit and drive toward Park City, turn left at Kearns Blvd, turn right at Bonanza Blvd. and left on Prospector Ave, drive behind strip mall, and turn right into parking lot. God blessed us with a wonderful day in the mountains. 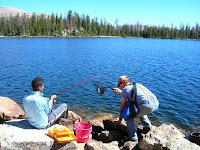 We began our journey at Trail Lake, seeing fishermen sitting on boulders. The easy hike took us through pine forest, across a wood plank bridge, and through beautiful meadows full of wildflowers. We saw a family riding horses, teenagers jumping off cliffs at Wall Lake, and even a backpacking team of goats. After the hike, some of our group went fishing at Trial Lake. DESCRIPTION: An enjoyable trail shared with horses, through yellow pine forest, and meadows. This trail is less crowded than the one at the Crystal Lake trailhead. RESTROOM available at Trial Lake. GEAR: Always take a jacket with you and food and water. FEE: $6 Mirror Lake Recreation Pass for 3 days. Or use America the Beautiful Pass on a rear view mirror hanger, displaying card with signature out. DIRECTIONS: Drive 17.8 Miles from Kamas, Utah, up SR 150, Mirror Lake Highway. Turn left at Trail Lake and go to fisherman parking. Parking may be crowded. There are several pullouts on the nearby road below too. TRAIL BEGINS nearby the Fresno Scraper and Historic Cabin. DESCRIPTION: Scenic parkway trail from Moose to Jenny Lake. This trail is open to bicycles, hikers, joggers, skateboards, or rollerblading. The trail begins at Dornans and ends at the south side parking area at Jenny Lake. On the return trip, you'll enjoy coasting back. MILEAGE: 8 miles each way. RESTROOMS: are available along the way, at various trailheads. NO DOGS allowed on the pathway. GEAR: Make sure you bring a bike lock. There are bike racks at Jenny Lake. BICYCLE RENTALS are available at Dornans near Moose. 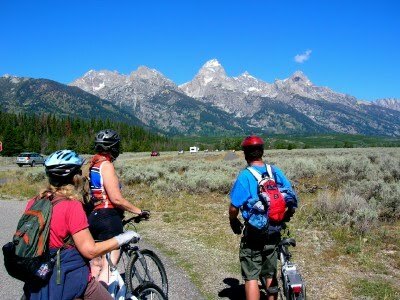 ALLOW 5 hours to bike and visit Jenny Lake. God gave us a cool refreshing day in the the mountains. Some of our hikers went fishing at Mirror Lake and caught rainbow trout. DESCRIPTION: Bald Mountain offers great views of Mirror Lake, Moosehorn, and the Uintas. This trail has a lot of exposure and steep drop offs. HIKE TIME: Allow 3 hours to enjoy this hike. FEE: $6 Mirror Lake Recreation Pass per vehicle, 3 day pass. GEAR: Make sure you bring a jacket. Bring long clothes in your car, in case it gets cold. Hiking poles are recommended. DESCRIPTION: Enjoy a mild hike around a beautiful lake. This is a great place for fishermen. There are picnic tables around the lake. RATINGS: NEWBIES, KIDS love this hike! We pray before we hike, for God's protection and He sends us angels to look after us. Today, the wildflowers were at their peak. DESCRIPTION: Lake Mary is the most popular kids hike in Utah. Along the trail are log benches. Lake Martha is a smaller alpine lake, up the hill from Mary. MILEAGE: 1.25 miles each way. DIRECTIONS: Drive up Big Cottonwood Canyon to the ski lift area and park. The trail begins by the gravel road, by the lodge. Look for the gravel trail, up to the Lake Mary trailhead sign. If you are an old timer, the beginning of the trail has been changed. RESTROOMS are available at Silver Lake visitor center. WATERSHED: No swimming, no wading, no washing and no dogs are allowed in Big Cottonwood Canyon. God gave us a wonderful day of hiking, and fishing. The smell of pine trees, blue sky and best of all, away from all the crowds! DIRECTIONS: From Oakley, Utah, drive up the Weber Canyon Road 12 miles. At the junction, turn right and drive to the upper campground. Trailhead parking lot is closed, due to a bad bridge in the campground. You need to park at the ATV lot, outside the campground and hike up the road to the trailhead. Begin the hike at the gated road. RESTROOM and water spigot near the trailhead parking area. Also, there are restrooms along the reservoir. RESERVOIR: $7 fee for boats on the reservoir. CAMPING at the campground is $19 per night and $7 for extra vehicle. Part of the upper campground is closed, because of bridge work. Cool day, hiking with Jesus! We saw a pair of moose, running deer, family of marmots, incredible wildflowers, saw lush mountains, and relaxed by a beautiful alpine lake. We even played in the snow! It was great to escape the hot valley! 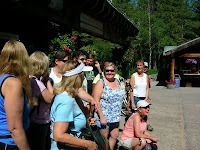 DESCRIPTION: We parked at Alta, at the wildflower festival and enjoyed a trail, through forest, streams and meadows. There's even benches to sit on, along the way. The trail joins the Cecret Lake trail at the Sunset Campground. DIRECTIONS: Travel up Little Cottonwood Canyon to Alta, and park near the information booth. Look for the trailhead sign, on the south side of parking area. 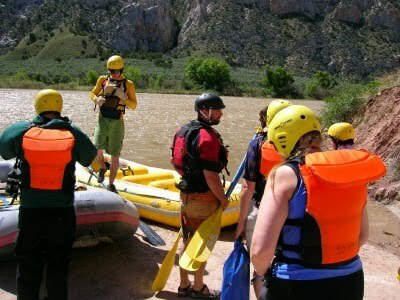 WATERSHED: Little Cotttonwood Canyon is a watershed area. No dogs allowed. No swimming in lakes, and no wading in streams. 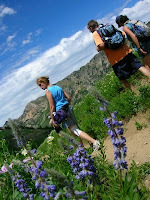 Alta has guided nature hikes during the wildflower festival. There are free shuttles, that take hikers up the road to other trailheads. The second annual bicycle ride was a success! After the ride we enjoyed a tasty barbeque, prizes and had wonderful fellowship. Join us next year for the third annual bike ride. DESCRIPTION: A fun ride on paved and dirt parkway trails in Park City. We met at Shepherd of the Mountains Lutheran Church. We rode up to the police station, down to the tunnel, up the other side of the road, coasted down the hill, and made a loop around Willow Creek park. RATINGS: all levels of bicycle riders. MILEAGE: 3 to 12 miles, depending on what group you followed. BE APART of this great fundraiser next year! All proceed go to support the chaplain ministry in the Salt Lake County Metro Jail. Come support a good cause! God blessed us with a blue sky, 72 degree morning, with cool breezes. A refreshing day for mountain biking and exercise. A wonderful day with Jesus! DESCRIPTION: A sampler ride, including paved parkways, dirt roads, and singletrack trails. We began at the Park City Rail Trail parking and went over to the Round Valley area. Where we went is a mystery? Join us next time. RIDE TIME: 2 1/2 hours, stop and go. RESTROOMS: Available at the ballpark near Round Valley & local businesses. GEAR: helmet, pump, bike tools, extra tube, camera, water, & energy snacks. DIRECTIONS: From SLC drive up I-80 to Park City, take the Kimball Junction exit, turn left on Kearns Blvd, turn right on Bonanza Blvd and an immediate left on Prospector Avenue. After passing strip mall, parking is on the right. MOUNTAIN TRAILS ~ Park City trails. Cool breeze, great friends, and a wonderful hike with Jesus! Fresh air, wildflowers, birds singing, and the smell of fir trees. DESCRIPTION: A beautiful, short hike up to one of Brighton's reservoirs. You'll see great view of Silver Lake on the way up. RATINGS: Newbies, great for kids and beginners. Some sections have loose rock, and may be challenging for those who have trouble walking. MILEAGE: 1 mile to the lake, 800' elevation gain. HIKE TIME: 45 minutes up; 30 minutes down. Allow several hours for fun. 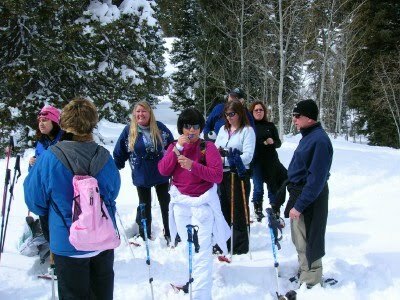 WATERSHED: Big Cottonwood Canyon is a watershed area. To protect our drinking water, no dogs are allowed in the canyon. No washing, no wading and no swimming are allowed. TRAILHEAD: Behind Solitude Nordic Center at Silver Lake. DIRECTIONS: Drive up Big Cottonwood Canyon to Brighton. The canyon begins at Fort Union Blvd & Wasatch Blvd, Salt Lake City, UT. RESTROOMS are available at Silver Lake. GEAR: Pack out all trash! Bring water, jacket, energy food, hiking pole, and camera. 24th anniversary, Outdoors with Jesus! God blessed us with great fellowship, waterfalls, blue sky, and a fantastic hike! DESCRIPTION: Purchase your ticket at the Lift House. Enjoy a scenic ride on the chairlift. You'll get off part way up the mountain and begin hiking through a forest. Make sure you bring your camera. You'll enjoy climbing up on a huge log to take a photo. There are a few steep hills and a stream crossing, climbing down to the falls. After cooling off in the falls, take the lower trail back to Sundance. RATINGS: Moderate, kids love this hike, but need to be watched at all times. CHAIR LIFT PRICE (1 ride) $10 adults, $9 juniors (6 to 12), and $7 seniors. GEAR: Wear shoes and clothing you can get wet. Also, bring a hiking pole, to give you support going down hills and walking across streams. DIRECTIONS FROM SLC: 1 1/4 hours drive time due to road construction. It's a wonderful day with Jesus hiking up Adams Canyon. Getting up in the mountains is like a cleansing from every day stress, and city life. Four year old Caleb hiked all the way to the falls today! 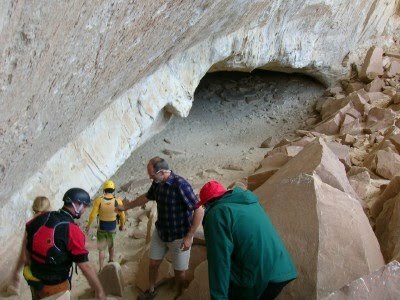 DESCRIPTION: Adams Canyon trail, is very popular trail. You hike up to the sandy trail to the Bonneville Shoreline trail, where you will have great views of the Great Salt Lake. The canyon trail, follows a bubbling stream, through a forest of firs, scrub oaks, box elders, and maples. On the trail, you will pass by a huge fir tree, cross a wooden bridge, follow hidden trails, climb over rocky areas, walk along narrow ledges, walk under huge logs, step on stones across the stream, and cool off by Adams Canyon Falls at the top. KIDS: Kids must be watched at all times, because of rocky terrain, exposure and rushing water. The trailhead is east of the intersection. Look for the parked cars. Get on the frontage road to find the parking area. Wonderful afternoon with Jesus, pedaling by horses, cows and farm animals. There is a new paved section, between Coalville road and mile 22, near Echo Reservoir. 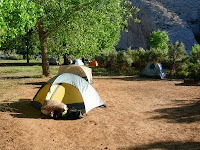 DESCRIPTION: We park at Wanship and ride our bicycles north to the first campground area at Echo Reservoir and back. We took a break at the Coalville station, where there is a restroom. RESTROOMS are available at Wanship and Coalville. MILEAGE: 19 miles round trip. GEAR: Thorn liners & slime are highly recommended. Make sure you have pump and tools to change flats. Water, energy food, first aid, and jacket. Make sure you bring salty food too.